Portland, a rural city in western Victoria, is on the west side of Portland Bay, about half way between Warrnambool and the South Australian border. Portland Bay was named by Lieutenant James Grant during exploration of Bass Strait in 1802. Grant’s mapping of the coastline was approximate, scarcely showing the indent where Portland is situated, omitting much of the coast to the east, and picking it up near Cape Otway. That whole stretch was named Portland Bay, as a compliment to the Duke of Portland, English Prime Minister (1793) and Home Secretary (1794-1801). The French explorer Nicholas Baudin, explored the coast in 1802 and charted it more accurately. Unaware of Grant’s visit, Baudin named the bay Tourville. Despite his superior mapping, the name Portland persisted. Bass Strait was the scene of whaling and sealing during the period from about 1810. William Dutton established an onshore whaling station at Portland in 1832-33, and in 1833 he was visited by the Tasmanian Edward Henty, who was on the lookout for good sheep grazing land. In November 1834, Henty landed at Portland with livestock and chattels to establish Victoria’s first permanent European settlement. It was 11 months before the Batman and Faulkner settlement at Port Phillip, later providing Portland with an historical priority which it has skilfully exploited at commemorative events. The Hentys were well to do sheep graziers and whalers. When they learnt from Thomas Mitchell, New South Wales Surveyor General, of the excellent pasture also to be found in Victoria’s Wannon region (1836) they pushed out in that direction. They had the wherewithal to maintain the Portland settlement in conjunction with other parties’ whaling activities. When Captain Foster Fyans, Police Magistrate Geelong, inspected Portland in 1839 he estimated the population at about 290 people. In the following year a town was surveyed and lots sold. On the wetlands north of Portland the Lake Condah Aboriginal Mission was established in 1867, one of seven Aboriginal reserves in the colony. It consisted of two-roomed slab huts with verandahs, gardens, cottages for the manager and schoolmaster and a substantial stone school house. It was closed in 1917, the land leased and its residents dispersed. By 1842 there were tracks from Portland to Hamilton and the Coleraine district, and by 1845 much of the western district was occupied by pastoral runs. Portland became an import and shipping outlet, and in 1846 a jetty about 150 metres long was built. Anglican and Presbyterian schools were opened in 1842 and Wesleyan and Anglican chapels were opened in 1842 and 1843. Government institutions included a court house (1844), a customs house (1849) and an immigration depot (1843). Among the numerous hotels from that period, three can still be viewed and are listed in the Victorian Heritage Register. Until the railways reached the western district, Portland was a convenient export port. The construction of railways occurred during the 1860s to 1870s (Ballarat 1862, Ararat 1875, Hamilton 1877, Heywood to Portland 1877, Horsham 1879) which corresponded with a decline in Portland’s population that persisted until 1900. The census figure for 1861 (2804) was not regained until the 1940s. Portland searched for new industries. 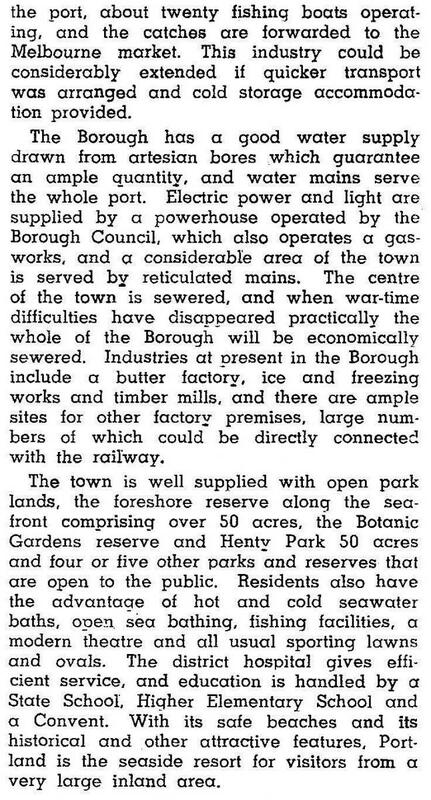 The search for industries had resulted in a frozen meat works (1892) which was acquired by Borthwicks in 1904. The works underwent steady growth, leading to a peak employment figure of 600 workers after World War II. Butter factories were opened in 1902 and 1912, expanding to Heywood in 1939. Somewhat ineffective breakwaters were formed in 1880 and 1891 to protect shipping from easterly weather, and a series of proposals were not acted on until a harbour scheme was constructed during 1953-60. 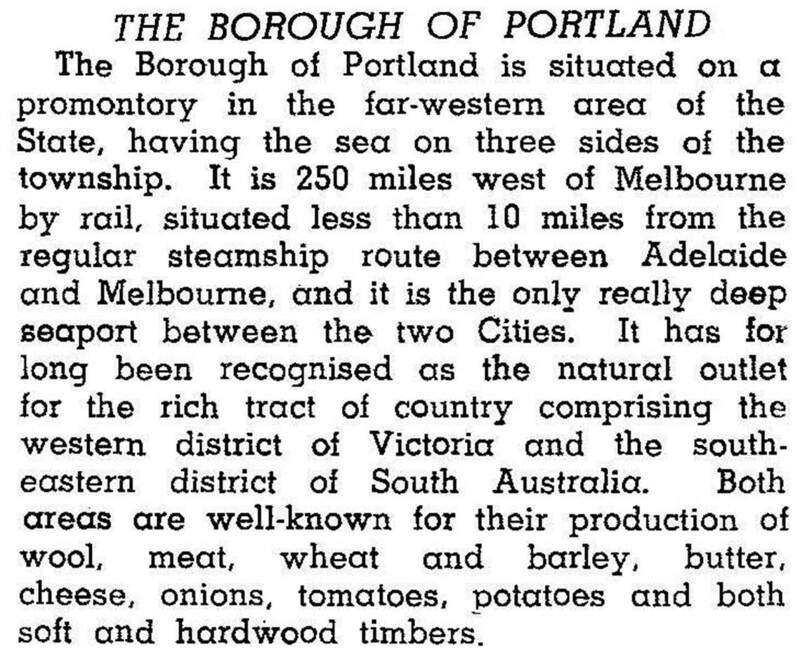 Tourism was another industry, not spectacularly successful but well promoted with Portland’s centenary in 1934, a year before Melbourne’s. The Portland borough council succeeded in persuading the State Government in 1944 of the need to develop the port. World War II intervened, but by the time that agitation was renewed the idea of industrial decentralisation was taking on. There were also record primary produce export prices. When the breakwater was built, Portland unilaterally began wool auctions in defiance of the Australian Council of Wool Buyers. After a government enquiry, the first successful auction occurred in 1963. By this time the breakthrough complemented a tanker berth at the harbour (1960), an expanded meat works, a fertilizer works, a fish cannery (1962) and the formation of a harbour trust (1950). In 1979 the State Government concluded an agreement with Alcoa for the construction of an aluminium smelter at Portland. The agreement took advantage of Portland’s deep water port, but required the building of a power line from the Latrobe Valley. The cost of power and declining world aluminium prices delayed construction of the refinery and caused many local infrastructure investments to fail. Full production was achieved in 1988, and Portland Aluminium reached a workforce of 700 (1998). The economic set back of the mid-1980s caused Portland to concentrate on its tourism potential. Its nineteenth century quiescence had resulted in the preservation of numerous historic buildings. In 1998 a foreshore Maritime History and Visitor Centre was opened. There are numerous hotels, motels, bed and breakfasts and camping facilities. Among the registered historic buildings are the former Steam Packet Hotel (1842), a former wool store (1846), the Old London Inn (1842-53), the old town hall, customs house (1850), court house (1845), numerous cottages and the former National School. Portland has an impressive array of pre-gold rush buildings. In addition to those mentioned, there are the Anglican St Stephen’s School (1842, the oldest in Victoria), the Presbyterian church (1850), and the Portland Inn at 4 Percy Street. Out of town historic homesteads include Edward Henty’s ‘Burswood’ (1853) and ‘Maretimo’ (1854). The visitor information centre has a walking-tour map. Portland’s population grew by 50% during 1966-86. It was proclaimed a city on 28 October 1985. After 1986 the population fell by about 1000 people in ten years. The city has extensive foreshore parklands, including a botanic garden. There are four recreation reserves, other open spaces and a golf course. The civic infrastructure includes a hospital, State and Catholic secondary and primary schools, a Lutheran primary school and a Technical and Further Education College. Portland is the administrative centre for Glenelg shire (1995). An aerodrome is 18 km from the city. The shopping centre, based around Percy Street, has about 150 shops. The railway from Hamilton has terminals in the centre of the city and at the breakwater pier. The Portland Observer and Guardian is published three times a week. At the 2011 census the leading employment sectors in Portland were in the metals industries. A group of wind farms termed the Portland wind farms located near Portland were opened between 2007-09, but the completion of the project was undermined in 2014 by the announced review into the Renewable Energy Target of 2020 by the federal government. A shire was proclaimed on 8 December 1863, with the title of Portland. Lacking the actual town of Portland, its Council meetings rotated among several townships until the Heywood mechanics’ institute was used for most occasions from 1890. Shire offices were built at Heywood in 1925. On 1 October 1988, the name was changed to Heywood shire. See Heywood shire for further details on Portland shire.